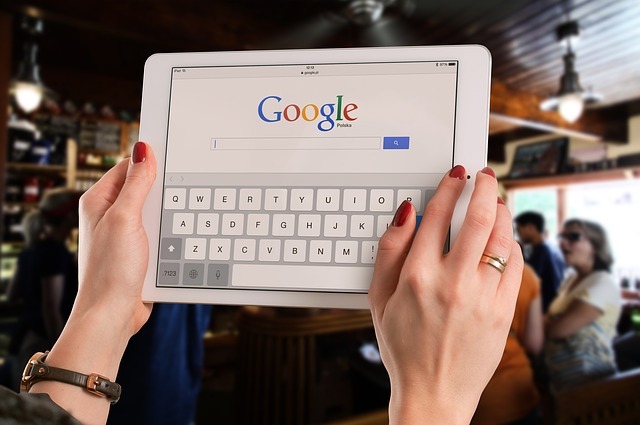 If you’re running a business such as a retail outlet or café in New Zealand that relies on nearby customers for revenue, then you’ll need to ensure you can be found on internet searches, especially via phones and other portable gizmos. The days of people pulling their car over to ask a local where the nearest shop is that sells this or that has been replaced by the smartphone and Google Maps. Local SEO (search engine optimisation) enables people seeking products or services online in a specific geographic area to find the solution they’re looking for. Say you’re a shoe store with a website, social media, and a retail store, and several competitors have a similar set-up. If your competitor nearby has local SEO in place, when people jump on their phones to google “buy new shoes”, then they will most likely head for your competitor’s shop rather than yours, credit cards at the ready. 78% of local searches from mobile devices result in offline purchases. In other words: your prospects are nearby, using their mobile phones to search for solutions, which they are likely to follow up on rapidly. 33% purchased from a different brand than the one they were considering, because of the information provided. In other words: your prospects are increasingly fidgety, drawn to relevance, and not especially brand-loyal. They want quality help, and they want it now. “Near me” searches are those where someone has added “near me” to their search query, for example, “Cafes near me”. “Near me” searches have been growing at a massive rate. Interpreting this, Google has been talking about the rise of a new type of consumer – more curious, demanding, and impatient than previously. People are being more specific when they search, and expect to be able to find exactly what they’re looking for, wherever and whenever they’re looking for it. Expectations will continue to rise. People will ask more detailed questions and want more personally relevant answers, and they’ll want it all quicker than ever. Businesses can take advantage of this, and figure out ways to capture the attention of the demanding customer with smart local search practices. What do you need to do to get found by nearby customers? It’s vital that your website contains relevant, useful information that instantly helps your customers. It needs to be easy to navigate, and must be responsive on mobile devices. A searcher will also desert a website almost immediately if its pages don’t load quickly on her phone’s browser, and that’s without even getting to the content. Sites such as Yelp, Trip Advisor, Zomato, and Facebook, as well as Google encourage people to submit reviews of businesses they’ve dealt with. You need to keep a weather eye on reviews online, and respond to both negative and positive comments promptly. Encourage your customers to submit a Google Review of your business by providing them with a link in your content. Here’s how to do it. A good number of authentic 5-star reviews will make a big difference to your local SEO. This means including words and terms that people use to look for your product or service, in your website content, and across other platforms as well. If your website is technically sound, and your on-page content is fully optimised, then you have a much better chance of being found on searches, and rewarded with a high ranking in search results. The goal should be to achieve a high search ranking without recourse to paid Google ads. 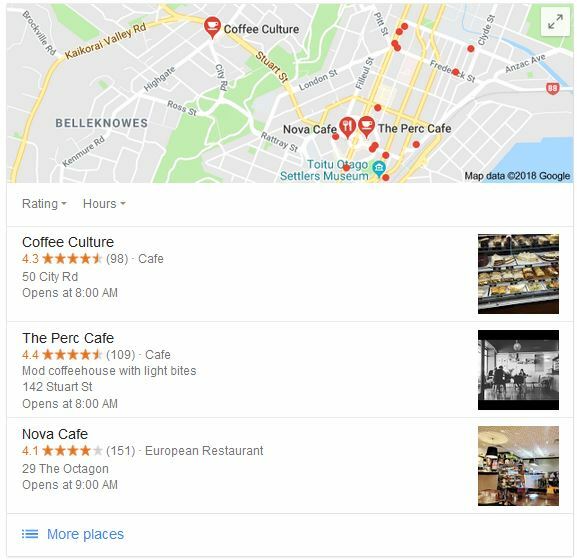 The image at right is a snip taken from a search for “dunedin city cafes” that shows the featured places box containing the top three local businesses for this keyword. This is what you should be aiming for, and notice the high number of positive Google reviews each of the three businesses has. Local businesses also need to implement Schema, a markup system for websites that makes it easier for search engines to identify important information for users. Aside from geographical and contact information, the local business section of Schema.org has a variety of useful categories for local businesses to use in website footers and contact pages. Another important local SEO measure is to put local keywords into the url structure of your website pages. This is a very important way to help people find your local business and control the information about you that shows up on Google Search and Google Maps. It’s free to join and all you need is a Google login. Make sure you enter information accurately, especially the name, address and phone number of your business (called NAP by the techies). Social media activity linked to your business is increasingly a factor affecting your position in the Google search queue. When you share relevant information about your business on social media channels, people engage with it, and share it with their friends. This increased awareness about you makes you more visible to the search engines. Google+, Facebook, Twitter, LinkedIn, Pinterest, Instagram, YouTube, and others are free to join and share information on, so they’re a good investment of your time and resourcefulness. Find out how your business is faring with searches, both locally and a wider audience. Many social media sites and Google have free products that allow you to analyse the performance of your website and track the sources of traffic to see where your audience is. Facebook, Google Analytics, Pinterest, Twitter, and YouTube, to name a few, have free analytics or insights functions that provide a fascinating view “under the bonnet” of your online presence. See our article on the reasons you should be taking notice of SEO for more information, or get in touch to chat about how we can help you further.